- A ball of light in the sky resembling a meteor was reported Sunday night by several people in Miami-Dade and Broward counties (US) on February 18, 2013. "Looking over the Biscayne Bay from downtown, I saw an object falling from the sky," said Brad Greenberg, 30, of Miami in a tweet about 6:30 p.m. "At first, the object was faintly glowing and moving fast but not nearly as fast as a shooting star." - TW reader from Timor, February 17, 2013: Today evening I was sitting in a car and for millisecounds I saw a ultra speed bright light in the sky….btw my position is east Timor . I believe more will come. - TW reader from Australia, February 16, 2013: TA meteor was seen in Melton, Victoria, Australia. Between 11pm and 12am on February 16, 2013. Approximate direction from E by NE to W by SW. Looked like clump of 4 stars at the head with a clearly visible tail. Occupied up to third of the field of vision of the two observers and lasted multiple seconds in view. Enough time to talk to each other about it as it was passing. - A fireball was also reported in United States. witnesses reported a fireball of some sort was seen streaking across the Bay Area skies, San Francisco. The fireball was seen around 12:45 UTC, on February 16, 2013. - Russian exploding fireball was covered in-depth and most people only heard about that one. 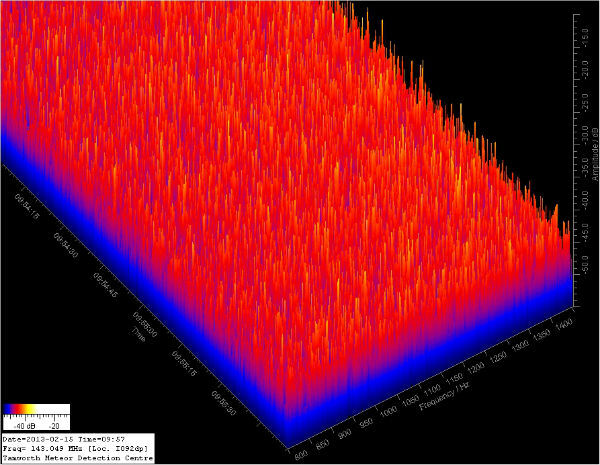 First reports came early February 15, 2013 at about 01:00 UTC. During the morning hours Russian military discovered a 6-meter crater, normal background radiation was reported. Russian Academy of Science said the meteorite weighed 10 tons before it entered Earth’s atmosphere but some reports mentioned 50 tons. The meteorite exploded nine times, starting at an altitude of 55 kilometers. The Russia meteor is the largest reported since 1908, when a meteor hit Tunguska, Siberia. The meteor entered the atmosphere at about 40,000 mph (18 kilometers per second). The impact time was 7:20:26 p.m. PST, or 10:20:26 p.m. EST on Feb. 14 (3:20:26 UTC on Feb. 15), and the energy released by the impact was in the hundreds of kilotons. Based on the duration of the event, it was a very shallow entry. It was larger than the meteor over Indonesia on Oct. 8, 2009. Measurements are still coming in, and a more precise measure of the energy may be available later. The size of the object before hitting the atmosphere was about 49 feet (15 meters) and had a mass of about 7,000 tons. The meteor, which was about one-third the diameter of asteroid 2012 DA14, was brighter than the sun. Its trail was visible for about 30 seconds, so it was a grazing impact through the atmosphere. - Late afternoon UTC time on February 15, 2013 people from Cuba apparently witnessed another bright fireball explode over the town in the province of Cienfuegos. More details here and here. - An enormous fireball was reported by numerous witnesses over Belgium, Netherlands and Germany on February 13, 2013. The sight lasted from 10 - 20 seconds. There were two separate fragmentations that shone brightly, one witness reported. Apparently it was part of Soyuz rocked. The 1800th flight of a Soyuz launch vehicle was performed on Monday, 11 February 2013 from the Baikonur Cosmodrome in Kazakhstan at 18:41 Moscow time (15:41 Paris time). Arianespace and its Russian partners report that the Progress cargo spacecraft was accurately placed on the target orbit for another mission to the International Space Station. This was the second Soyuz family mission in 2013. Detailed witness reports here. "According to NASA scientists, the trajectory of the Russian meteorite was significantly different from the trajectory of the asteroid 2012 DA14, making it a completely unrelated object. Information is still being collected about the Russian meteorite and analysis is preliminary at this point. In videos of the meteor, it is seen to pass from left to right in front of the rising sun, which means it was traveling from north to south. Asteroid DA14's trajectory is in the opposite direction, from south to north." α–Centaurids meteor shower last from January 28 until February 21. The α-Centaurids are one of the main southern summer high points, from past records supposedly producing many very bright, even ﬁreball-class, objects (meteors of at least magnitude −3), commonly with ﬁne persistent trains. However, the average peak ZHR between 1988–2007 was merely 6 (HMO, p. 130), albeit coverage has frequently been extremely patchy. Despite this, in 1974 and 1980, bursts of only a few hours’ duration apparently yielded ZHRs closer to 20–30. Approx 5:39am EDT Sunday May 5 2013. Bright high speed object moving SW to NNE in western sky, about 30 degrees above horizon. Leading in a moderate size fireball with a long, slowly fading tail. Duration 10-15 seconds. If this was a meteor, it's the most spectacular I've ever seen. Consistent w/ descriptions of the Eta Aquarids w/ horizon to horizon, long duration meteor sightings know as earthgrazers. Saw a green "meteor" burn up in the sky here in Los Angeles around 10:30pm Thursday 2/21. Was heading straight down in the western horizon but burned up before going down behind the trees across the street. I saw it also from Whittier. And according to the panicmongers, the world was supposed to end LAST year, and BtW, won't you ask yourself just how many End of the World predictions (or EW predictions, as I like to call them) have panned out? How many charlatans, how many scams, how many panicked suicides must we endure before we finally let the end comes, WHEN it comes, without waiting on it on the edge of our seats with baited breath and brains stuck on hum, like they're being used for toaster-ovens, like we've outsourced our thought processes to jump-happy old-time Jehova's Witnesses, like we don't really have the first clue as to the difference between a sundog and NIBIRU, for God's sake, how many times before we wake up and smell the tragedy of our own wasted fear? I am just so SICK of it all. Hello there, I'm writing from Brasil to report that we had 2 fireballs this morning ( 11 am local time) over Rio de Janeiro state. Hundreds of people saw it and called INPE (our national space institute) to report on it. There are no pictures of the event, as it was very fast, but it was seen on two states, with 30 min apart. I'll post some links, it's in portuguese. http://g1.globo.com/jornal-hoje/noticia/2013/02/rio-de-janeiro-e-espirito-santo-veem-passagem-de-meteoro-pelo-brasil.html http://g1.globo.com/rj/serra-lagos-norte/noticia/2013/02/astronomo-confirma-passagem-de-meteoro-por-cidades-do-interior-do-rj.html http://www.correio24horas.com.br/noticias/detalhes/detalhes-1/artigo/meteoros-caem-no-rio-de-janeiro-e-no-espirito-santo/ http://www.ofluminense.com.br/editorias/cidades/fisico-confirma-passagem-de-meteoro-por-cidades-do-rj It's so exciting!!! What's going on??? I believe that the scientific term for what happened is "coincidence". Let it remain so without any post hoc ergo propter hoc scenarios like Nibiru or angry aliens or even solar flares. Rocks from space do not behave the way they do in movies; that is to say, there is no buildup of suspense with ominous orchestral music swelling in the background while we wait for the biggest one to hit (and then Bruce Willis saves the day). Coincidences happen all the time in nature and the universe. Massive, unbelievable, mind-blowing COINCIDENCES. No such thing as a coincidence Dear friend...coincidence that its just past 2012 Mayan end date? The beginning of the End as they say. Get yourself out of the city, get yourself to the countryside or the mountains, bring your friends and loved ones together. The Australian trail over Melbourne look exactly like a chemtrail. It was probably left behind by QFA64 which often leaves trails exactly like that. Today evening I was sitting in a care and for millisecounds I saw a ultra speed bright light in the sky....btw my position is east Timor . I believe more will come. COINCIDENCE?... all this meteorite activity is LIKELY related - because large matter collisions in space can scatter debris - which can take a few days to play out. It is a pattern familiar to real scientists who study astronomy not the phony interviews created by MSNBC sewer media. Wasn't it just a year ago that strange sounds were being heard in diverse parts of the world? did anyone hear or see a meteorite over santa fe nm at about 12:18 a.m. last night Feb. 16, 2012 ? Just go back to sleep and watch American Idol..nothing to see here. More such events may be anticipated over the next 3 or 4 years. http://barry.warmkessel.com/2016impact.html 2016, TOLLMANN'S HYPOTHETICAL BOLIDES RETURN The last Pope is soon to be chosen. Somebody, somewhere has a book and a bombproof bunker to sell you. And some people would think it was the End of the World if someone farted too loudly. BTW, 2012 was last year. The Tunguska "meteor" of 1908 was thought to be a Tesla generated event. Haarp anyone? Remember the Norway Spiral? Ah, the Norway Spiral -- the prettiest rocket malfunction ever photographed! How about a little "End-of-the-World Fatigue"? We can call it "EWF" for short. A meteor was seen in Melton, Victoria, Australia. Between 11pm and 12am on 16/2/2013. Approximate direction from E by NE to W by SW. Looked like clump of 4 stars at the head with a clearly visible tail. Occupied up to third of the field of vision of the two observers and lasted multiple seconds in view. Enough time to talk to each other about it as it was passing. Pictures of UFOs at Cheylabinsk at: http://bitchworld.weebly.com/sightings.html Anybody connecting the dots with the tens of thousands of nuclear weapons that bourse has mined the planet with? Meanwhile, back in the world of mice n men and 'approved news sources' the top headline reads 'Best Chinese restaurants in the U.S.' Thank you for the information. A meteor was seen in North Alabama Thursday night. A Birmingham, AL meteorologist, James Spann reported it on his website. Cuba, Russia, and other countries are cursed and therefore they get the wrath of G-d. But Probably areas, in the U.S.A. will be hit, cause Long Island/NY metro area is cursed to for all the scams, cons, frauds, they do.. Check out the video of the asteroid video from Japan and look at it 19 seconds in to it. What was that? I think that is a reflection on a piece of glass, maybe the camera is in some sort of enclosure. 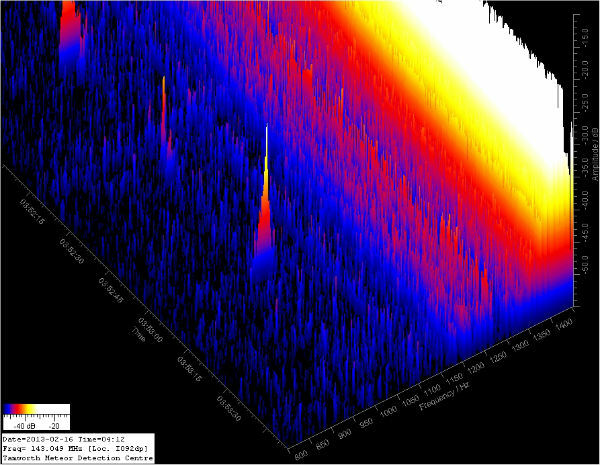 It's like a mirror image of the meteor, but attenuated, due to the reflector being a glass and not a mirror. That was a lense flare. that seems to be refractory light in the lense of the camera. it does seem to be a ufo, but the linear trajectory is the same, but opposite. Now maybe the human species will wake up a little bit, to what is going on around us. Lets not forget about all those rogue planets some of which may have been slung out of the centre of the galaxy in that hornet's nest of gravitational interactions going on in there too! ...and gamma ray bursts still in transit that we don't know about yet because the information cannot travel faster than light. As for planet X ? Hard to say there's just one or more, or none without ever having any solid evidence. To sum it up, there's heaps going on above as well as below too, and mankind is also short-sighted -- allow a few generations to pass without incident and people forget...or ignore the possibilities. Not saying anything will happen tomorrow or in the near future but given time... if its even remotely possible, it will happen. Japan, Russia, and Cuba have more weather problems than any other town i believe those towns are cursed because something is always going wrong. Cuba, Japan nor Russia is a town. They are countries, just like the USA. And if you would have mentioned Havana, Tokyo or Moscow, you also would be incorrect. They are cities, and in this case it is even their capital. And why should they be cursed? Are people really that uneducated and ignorant nowadays? They do not have more weather problems then the rest of the world. A meteorite impact is not a weather related issue, or an earthquake, vulcanic erruption, tsunami etc. They might affect the weather, but are besides that 2 different pair of shoes. But when journalists already struggle alongside with everybody proof reading their material you can't expect more. The trajectory of the Russian meteorite.....i did not know they owned it then or put claim on it. After impact they can, should they be able to retrieve it, but not before. The trajectory of the meteorite OVER Russia....that would be correct! But even 7 out of 10 english teachers from the USA also think 'above' can be used. The same amount of european teachers asked knew even their difference in the correct usage of 'over' and 'above' and gave examples. It seems minor, but is actually a big problem. At one point we got retardation everywhere. Russia-Japan and Cuba are towns now are they?? Now come on June, even you can't be that ill informed!!!! or are you trying to making a not very funny joke here????????? Also wondering if any institutions, etc has done some research on the possible trajectories of the expanding debris field left over by the Comet 17P/Holmes explosion a number of years back? By now, I would hazard to guess the interactions with the gravitational fields of the planets as well as their orbital dynamic may have caused some of the larger debris to cluster into filaments while the smaller debris would have been significantly pushed away by the solar wind. Anyone? that would be nice if they added that as additional info to the article, but that seems to be too much to ask for to add a simple link from nasa.